That’s how Reverend Alba Onofrio felt after hearing that white nationalists, including some people affiliated with neo-Nazi groups, planned to descend on Charlottesville, Va., to protest the pending removal of a Confederate statue. “It felt urgent that I, particularly as a queer and Latinx activist who fights all day every day for LGBTQI rights, see and respond to racial justice issues as one and the same,” Onofrio told NBC News. 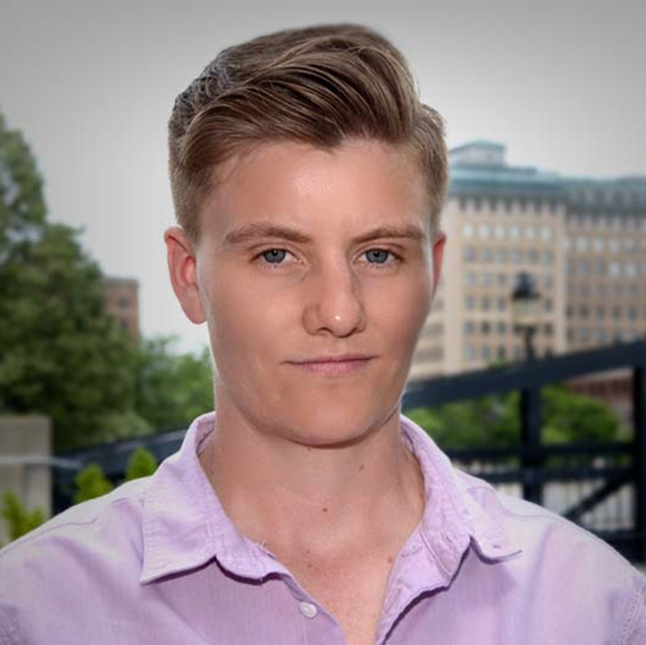 Onofrio, who uses gender-neutral pronouns like they and them, is a spiritual strategist for Soulforce, an advocacy organization that challenges the oppression of lesbian, gay, bisexual, transgender, queer and intersex people from the religious right. 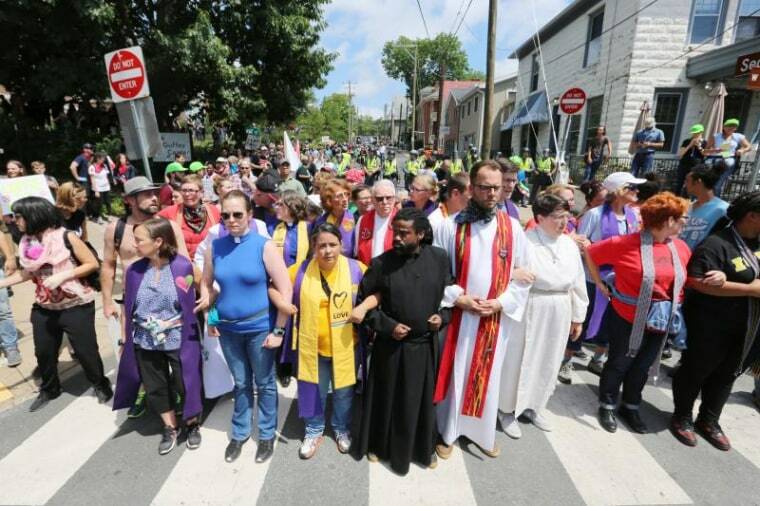 The 36-year-old joined 1,000 clergy members from Congregate Charlottesville on Saturday to confront the white nationalist “Unite the Right” protesters as they marched on the University of Virginia campus. Some clergy were Christian, others Jewish and Muslim, Onofrio said. In stark contrast to the mostly young, white, male protesters — many who wielded torches, others waving Nazi and Confederate flags — Onofrio and fellow clergy walked the streets in religious garbs, handing out food and saying prayers. When violence broke out, they formed human shields between protesters and counter-protesters, protected those who were injured or exhausted and provided spiritual and emotional comfort to those in need, Onofrio said. “What it did was it created a space where people’s spirits were allowed to be present, and not just like you either have to be fighting or you have to be strong or you have to be on the defense, but just that space of like, ‘OK, this space is a place where I can just be in pain and just be hurting,’” Onofrio explained. When a white nationalist drove his car into a group of counter-protesters, mowing down 20 people and killing one, the scene erupted in chaos. Onofrio and fellow clergy members rushed to help. “The news said there were 19 injured plus the person who had died, but there were just so many people who were hurt, but not badly enough to go to the hospital, and [they were] so young,” Onofrio said. The reverend and other clergy comforted those who were traumatized by the incident. “We were in a semicircle, and some of us were praying, and this person just walked up to us and just kind of fell into the arms of one of our Muslim sisters and just had a breakdown,” Onofrio recalled. “Our community being LGBT people, our community being immigrants, women, people of color in general, we have such incredible offerings, and we are such beautiful representations of the divine." To the proud Latinx Southerner who grew up in North Carolina, the tragedy, and the Confederate statue that sparked it, are painful reminders that white supremacy still exists. “It feels like our greatest wound is being lauded as though it is something to be proud of,” Onofrio said of the Charlottesville monument to Gen. Robert E. Lee, which still stands in a local park. Despite the tragedy, the fight for social justice is something Onofrio feels compelled to continue and one they believe will be won. “That for me is worth dedicating every moment of every day of the rest of my life to,” Onofrio concluded.